Firstly, check if you do need to keep your insulin cool. It’s fine in the cabin where it does not need to be refrigerated. If you are going on a long, hot car journey or to a very hot country then you might want to look at ways to keep the insulin protected. Below is a selection of bags, wallets, fridges and travel friendly accessories that will allow you to keep your insulin cool on the move. In some kitchen shops there are clever lunch boxes with little freezer packs, often used to keep salads cool and fresh and these too would work for keeping insulin safe and cool and you can choose from different sizes as to what would work best for you. Medicool has a range of bags that include insulation such as the PenPlus case which can protect valuable supplies. Useful for men, women, children, seniors, and medical personnel it can be attached to a belt, placed inside a purse or briefcase, or carried by its detachable hand strap. 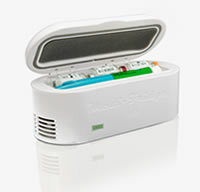 This case can hold up to four vials of insulin or two insulin pens keeping them safely cool for up to 12 hours. Another brand that focuses on keeping insulin cool is Frio which has a series of simple and convenient cooling wallets. Light and compact, they are a means for diabetics on insulin therapy to transport or store insulin, particularly if traveling to hot climates, keeping insulin at a safe temperature without the need for refrigeration. Check your insulin storage instructions for exact details on the storage needs of your type of insulin, and if you think a safe cool bag is in order, then the Frio bags work without refrigeration - activated by water only - and are re-usable, durable and long lasting. The MediFridge was created by Type 1 diabetic Dr Olaf Diegel and his brother, Uwe Diegel, who is the managing director of a medical business in Paris. Already a well-versed traveller used to travelling with his insulin and keeping it cool using ice-boxes and cooler bags, Olaf and his brother decided, “just for fun”, to design the portable fridge that would use a Peltier Effect to create cold without gas or moving parts. The latest version of the Medifridge (MF-MXIIa) is perfectly adapted for most heat-sensitive medications, such as insulin, growth hormones and medication for poly arthritis. The MediFridge is approximately £83 plus P&P. You can also just look out for generic cool packs - you can get them in places such as WHSmiths, M&S, many supermarkets and even some petrol forecourts, or of course you can look online. You may be able to add these to whatever you use to keep your kit in, such as a Desang kitbag. Among them are Chillerz Packs, which when frozen, will keep insulin cool when required. These reusable ice-packs can stay frozen for days or hot for hours. Supplied in packs containing three sheets of 24 cells. Each cell is approximately 2”x2” (5cm x 5cm). One of these will fit into the smaller of the two pockets in Desang Classic and Slim kitbags along with insulin cartridges. Each pack costs £9.95, plus VAT and P&P. Another generic brand is Polar Gear, which does a range of bags and boxes that keep foods cool, but will work just as well for insulin. Some of their ranges would work if you put your entire kitbag inside them.